CoLED extends a heartfelt thanks to all those who attended and sponsored our first CoLED conference, ETHNOGRAPHY & DESIGN: MUTUAL PROVOCATIONS. The conference was hosted at UC San Diego on October 27-29, 2016. The conference represents the culmination of the first phase of our multi-campus collaboration 2015-2016, and offered a public-facing three-day-long symposium and workshop series designed to open the CoLED conversation to a broader crowd of ethnographers, designers, practitioners, and scholars at the intersection of ethnography and design. In recent years, design and ethnography, and practitioners of design and ethnography, have found a variety of new engagements and mutual provocations. Many ethnographers work in collaboration with designers and design researchers. Others are curious about how designers have taken up, made use of, and transformed ethnographic research strategies to gain insights into how to redesign objects, infrastructures, and social or institutional systems. Many academic ethnographers see design practice as complicit with global capitalism, industrialized manufacturing, consumer product marketing, and modern nation-building. Still others are interested in how ethnographic practice might be transformed by an engagement with studio design, bringing some of the research modes and strategies developed in design research back into the service of academic research. Many ethnographers are interested in innovations in research design that engage new media and frontiers in digital, visual, and performative formats. At the core, the conference engages with what our collaboratory has come to call ethnographic design: the ethical and political stakes of ethnographic method and form. Ethnography and Design: Mutual Provocations brings ethnographers working in all of these modes together for a series of curated, provocative conversations. Addressing issues in ethnographic design through a “keywords” format, the conference and subsequent multimedia production will ask: What is Ethnography? What is Design? Who decides? What are the implications for theory, practice, and real world outcomes? See what people were tweeting in real time on the conference Storify! Download the conference flyer in PDF format here. ETHNOGRAPHY & DESIGN: MUTUAL PROVOCATIONS will take place at UC San Diego on October 27-29, 2016. The conference is open to students, faculty, working ethnographers, and the general public. Space is limited, and workshop participation will be capped at appropriate numbers. General registration to attend the conference is now open. Please register here. There is a nominal, tiered registration fee to cover organization, programming, and lunch. The fee will be waived for those attendees who are selected to present a workshop or session as part of the conference program. Session proposals can be submitted for consideration until July 15th. The main conference venue is the Great Hall at iHouse on the UCSD campus. Recommended conference hotels are the Marriott San Diego La Jolla (a short shuttle ride and walk from the venue) and Estancia La Jolla Hotel (walking distance from the venue). 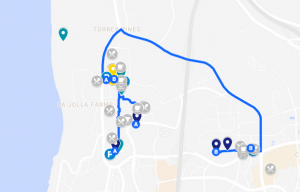 Getting around: Visit the interactive conference map to find parking, conference venues, and nearby eateries, with links to the conference program and Google Maps directions. Registration to attend the conference is now open! Register here. Explore the Conference Program using our online tool. Conference attendees will have the opportunity to participate in experience a variety of sessions. The CoLED conference committee strives to program conference sessions that take up and theorize the ways in which negotiations between design practice and ethnographic methods offer themselves as experimental forms of engagement, techniques of knowing, and proposals for interacting with the world. As a research network, CoLED fosters a supportive and playful environment in which graduate students and faculty can engage in speculative and experimental modes of thinking and doing. We are, by design, resistant to “traditional” modes of academic exchange, and will privilege submissions that offer interactive modes of sharing and exploring methodologies through movement, performance, media, and experimentation. Proposals for individual and group workshops are closed. However, organizations interested in collaborating with the conference committee to present a co-sponsored special event during the conference are invited to get in touch directly. Contact Cassandra Hartblay at chartblay@ucsd.edu with “Mutual Provocations CfP” in the subject line. Register here or follow along on Twitter and Facebook #CoLEDConf! Explore the Conference Program now using our online tool. Download a PDF version of the Conference Welcome Packet. The conference is structured around a series of roundtable events, with ongoing concurrent participatory workshops and performances. In keeping with the conference theme of mutual provocations between design and ethnography, the roundtables are be organized as a series of encounters between keywords (see the Invited Speakers tab for a list of scholars presenting keywords). We do so with the intention that the juxtapositions between the words will provoke discussion by highlighting tensions that populate the intersection of design and ethnography. Concurrent with the roundtables, CoLED members and invited guests will host workshops to share innovations in ethnographic theory and methodology. These workshops have been debuted and examined with CoLED members during the course of a series of internal workshops leading up to the conference; the intention of the conference workshops is to share the work of CoLED with other conference attendees. The CoLED Conference Committee is also pleased to present workshops, labs, and artworks selected from a competitive pool of proposals from scholars external to our network (the Call for Submissions closed in July, and notifications were sent in August). The detailed conference program is now available online. We encourage conference goers and prospective attendees to explore the features of the scheduling tool, including building your own custom schedule and view the program by venue, time, or programmatic theme. In the coming weeks, conference participants who have registered will have the opportunity to sign up to attend workshops with a capped participation level. This pop-up exhibition presents ethnographic projects that engage deeply with arts practices. By working with ideas and techniques from sculpture, performance, sound composition, experimental film and video, and photography, these ethnographic projects explore possibilities for reflexive, speculative, activist, collaborative and community-based ethnography. ETHNOGRAPHY & DESIGN: MUTUAL PROVOCATIONS is delighted to list this event, payed for by the California Native American Day committee, and other sources of funding, as part of our conference programming. RSVP at CANADaycelebrate@ucsd.edu or contact Julie Burelle for more information. A dynamic, detailed version of the conference schedule is available here. Download a digital version of the welcome packet (PDF), including a two-page schedule of events. The below summary is provided for those seeking a quick overview. A detailed conference program including a personal schedule building tool is online here. Find us on Twitter! #CoLEDConf #CoLED or watch the Storify slideshow!